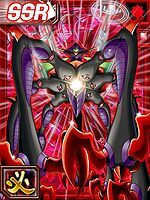 Ogudomon is a grotesque Super Demon Lord who has seven legs and eyes, as well as an eighth eye. 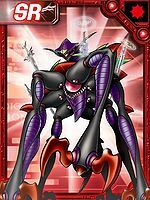 As it includes the whole of the Digital World's sins, and moreover, is a mysterious personification with the ability to atone for them all, the power of a Digimon with even a small amount of malice is counterbalanced, and it is impossible for it to defeat Ogudomon. Its Special Moves are running wild after its own lusts (Oratio Grandioloqua), and a shock-wave played from its mouth (Catedral). Also, it pulverizes its opponent with its gigantic legs (Gradus). This profile matches its partner in the Digimon Reference Book, except for the retention of the translation aids. Title: 「贖罪の超魔王」 — "Super Demon Lord of Atonement"
n., From Ogudoado 「オグドアド」, meaning "Ogdoad". 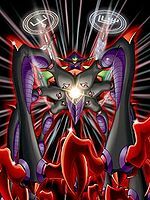 Ogudomon's design is based on the Gnostic Ogdoad. 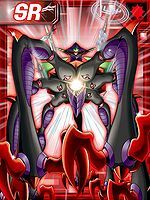 In this conception, the Seven Great Demon Lords themselves would correspond to the seven Archons and their seven planets: Saturn, Jupiter, Mars, Venus, the Sun, Mercury, and the Moon. 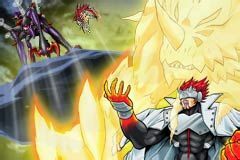 Ogdomon then is associated with the eighth sphere and seat of the fallen Aeon, the Ogdoad. As a result, each of Ogudomon's enormous legs has a sword pierced through the knee; each sword is themed after one the Seven Great Demon Lords coupled with one of the crests of the Seven Deadly Sins in which they represent. Catedral  Esp: Cathedral カテドラール Katedorāru Produces a shock wave from its "mouth". 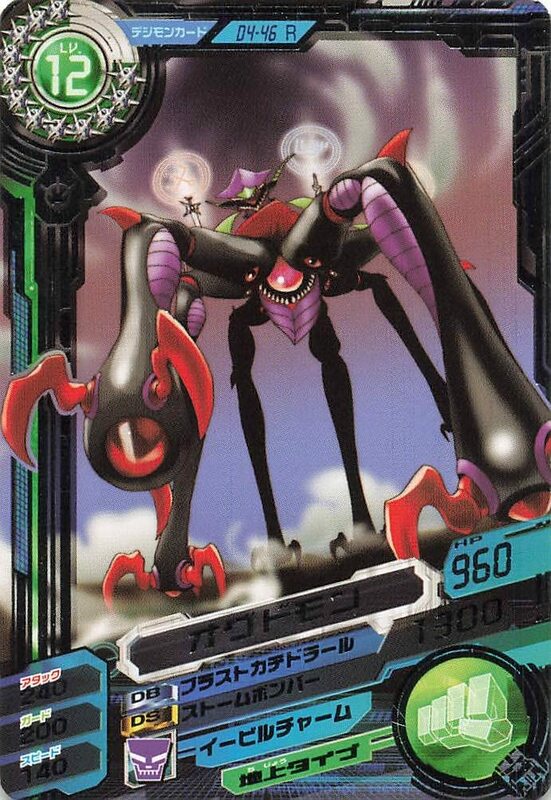 Lat: Step グラドゥス Guradusu Pulverises the opponent with its enormous legs. Lat: Grandiloquent Speech (Literal) オーラーティオ・グランディオロクア Ōrātio Gurandiorokua Runs wild after its own lusts. 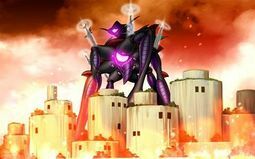 Ogudomon serves as the final boss in the main storyline of the game. Ogudomon is available as a Digimon Medal. 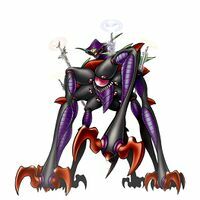 A grotesque Avatar Digimon. It has the ability to instantly nullify attacks made by Digimon that have committed sins consciously. Ogudomon is the boss Digimon of the arcade game's final version. ↑ Oratio Grandioloqua is Latin for "rhapsody"'. A more literal translation would be "great eloquent boast". It could also be a small misspelling of "Oratio Grandiloqua" (オーラティオグランディロクア Ōratio Gurandirokua) which can be alternatively translated as "grandiloquent speech", comparable to rhapsody from Latin. The kana for this at Digimon Reference Book appears slightly differently to what is displayed on the card (オーラーティオ・グランディオロクア Ōrātio Gurandiorokua). This page was last modified on 27 March 2019, at 18:12.